It is always a joy to publish your writing, Ian – you are one of the pure in heart, mind, and spirit, my dear internet friend. It is truly a privilege to know you. As the snow on the roof gets whiter, the fire on the hearth banks down to a bed of warm, comforting embers and St. Peter has booked you into one of the cheap seats, you tend to take a more expansive, perhaps more perceptive, view of life, of politics – even your own backyard. I went down the backyard yesterday. I needed to ask a question of the “folk” who live in the patch of remnant bush just over the fence. They’re indigenous and I know their proper name, though I do not speak it. It is not my earned right. The “folk” will suffice. They didn’t appear to be around so I sat on a garden bench. Enjoying the warm sun, I looked at the back of my house. I saw the faded, stained cement tiles of the roof. Years of birds, overripe mulberries and various attacks by footballs, cricket six stitchers and benign tennis balls had left both their marks and memories. I then looked to beneath the tiles. Imagining seeing the joists, bearers and beams that had supported them for 70 or so years. Had all this timber come from the same forest giant? Does it retain in itself the memories of hundreds of years of growth? Have those memories enabled the roof to fulfill the integrity of its purpose? Scorching heat, cold snaps, high destructive winds. None has budged the roof … not once. The integrity of its purpose is strong. Perhaps as a political philosophy should be. The stains gave me cause to remember the mulberry tree. Sadly, gone now. A victim of the damage it caused to pipes and paths. The wonderful shade on a hot summers day, the sweet fruit, the pies and cordials it made. The screeching, raucus cacophony of flocks of corellas after having tasted the delights of fermented mulberries. The quieter dawn chorus when the corellas, purpled stained heads firmly under wings, studiously avoided the warblings of magpies, gentle calling of doves and the unrelenting chittery chattery of indignant wagtails. If I were given to name the flock of corellas….it would be “the Press Gallery “. The rest of the garden just melts into itself. Each section a memory and part of the whole. The sour, acidic soil of a rose bed where, among the insipid pale hybrids, a strong red blossom evolved, thrived and was eventually weakened. A transplant to the old, yet strong, arbour has it thriving again. Perhaps the enthusiastic input of the miniature roses whose bed it now shares has helped. I leave the sour acidic ground as a reminder of what damage can be wrought by a poison and will speak no more of it. 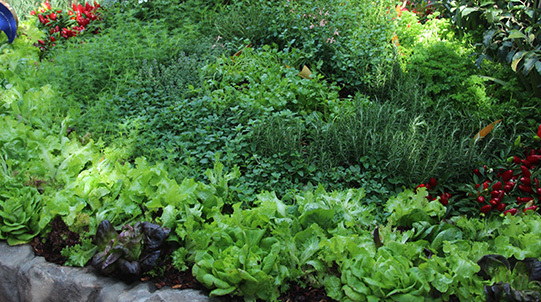 The vegetable and herb beds take my eye. The herbs in particular. They’ve grown into the greenest, healthiest herbs with a depth of flavour that leaves palates with the understanding of what heaven can be and, most assuredly, is. They grow in a bed that started life as a fish pond and morphed into a wishing well. I believe the plants are fertilised with memories of wishes fulfilled and where dreams are begun. Could it not be that the filling of a wish sets free an unrealised dream? One day, perhaps, the wish of a child may lead to dreams of a nation. I wish it so. The “folk” haven’t shown themselves and I haven’t been able to ask my question. Somehow, I feel I have an answer. We’ve been having strange weather this week, with heavy fog more like autumn than early spring. Most days the fog has cleared by late morning … but not today … and who did the week’s laundry this morning? There wouldn’t be many occasions in living memory when a Prime Minister was asked to defend his Treasurer in Question Time and sat silent. That said it all about this Prime Minister who doesn’t want to be near his Treasurer or his Budget. That stood apart from everything else this week. 1. Often in Question Time we talk about how many people are affected by Government policies. On Wednesday Bill Shorten made it about one person, Jacob Floyd. Jacob, who Bill met the day before, is from Bendigo and will be affected by the privatisation of Australian Hearing. 2. Check out this speech from Bill. My favourite part is at 3:18 seconds when Bill talks about the antics of the Government over the five week sitting break. 3. Just before Question Time on Tuesday there was speech after speech from the Labor Caucus hammering the Government’s unfair Budget. 4. Combine the core Labor value of universal healthcare with one of our strongest advocates and you get this speech from Shadow Health Minister Catherine King. 5. Penny Wong is on Facebook. I know this email is meant to be about Parliament, but Penny Wong is finally on Facebook! 1. Joe Hockey arguing with Joe Hockey on Tuesday. 2. Joe Hockey still arguing with Joe Hockey on Wednesday. 3. Joe Hockey was beaten in an argument against Joe Hockey on Thursday. Why can’t Joe Hockey just get along with Joe Hockey? 4. Poor Warren Truss. The Leader of the National Party claimed on Wednesday Labor was holding up funding for local roads. The problem was, Albo had brought on the debate for the funding the day before, only to find the Government voted to oppose their own measure. I’d like to say someone should have told Warren, but he was in the Chamber voting against it himself. 5. On Wednesday Communications Minister Malcolm Turnbull released a report on the NBN (written by his former staff). It proved that a slower, less effective NBN will cost less. Thanks Sherlock. Ho hum – another week, another Liberal bites the dust at New South Wales’s ICAC; Kathy Jackson seems to be looking into that abyss called The End of the Age of Entitlement; JoHo is now officially embattled. Today’s Guest Post is a fiery rant by Jaycee – many thanks as ever. We won’t have it! We won’t take it! We don’t want it! We don’t want the sickly pessimism of these failed penny-ante philosophers, these failed leaders, these failed and failures of small-minded-people that head and advise this government. Look at them! … Failed priests, failed fathers, failed relationships, failed businesses, failed careers … Fail! Fail! Fail! … and they want to tell US how to live our lives! – strong>US, the majority of whom have gone down the hard track of self-training, self-employment, single mothers, full families full work-load and all the trials and tribulations of life and living. Give us a break! AND GET OUT OF OUR LIVES! The Gillard administration put in place a perfectly decent set of policies that laid the foundations for a fair, equal and financially secure society. But it has been trashed by these failures who are now trying – AND FAILING AGAIN! – to sell us a dodgy set of ideological slogans that will only lead to many young people failing in their quest toward a decent life and career! That is because the only politics those of the right-wing lobby groups, think-tanks and individuals can promote is Failure Politics … that’s all they got to offer. Infrastructure: Dismantling or environmental damaging = Fail. Social safety net: Dismantling and abandoning the most vulnerable = Fail. Health Coverage: Destroying or Favouring the privileged = Fail. Education: Over-pricing or under-delivering = Fail. Environment: = Fail (without even listing the items!). Communications: Complete destruction to favour a “failed mate” = Total Fail! Foreign Policy: Insult nearly every neighbour, religion and culture = Fail, Fail, Fail. One could go on and on and on … failure after failure, stumble after stumble … f#ck-up after f#ck-up … and no contrition or admission … just a continued game of “blind man’s bluff”. To criticize this government has become a question of “Where to start” … seriously, where does one start? … It’s like picking up the pieces of broken crockery … it is total chaos, total failure… . In fact, never since the second world war has the anagram “SNAFU” been more apt … never! So let’s get serious and consider. What does one do in the workplace when one is confronted with management that has no idea how to run a situation, yet is in charge? One leaves it in place but powerless and by-passes it. Here we have a bit of a problem: the fools in charge THINK they know what to do, have the power to implement it, still bugger it up, and then move on to the next disaster in waiting! It seems it is WE who are powerless. But wait a minute – we have one thing going for us that has the potential for mighty power, as we have seen when we unite on social media locally to punish companies who back a stupid idiot when they do a stupid action. Perhaps we need to up the ante a tad or two and start to unite the voice of social media internationally to request NATIONS to stop buying products from certain corporations that are manipulating the politics of governance, or the united voice of people on social media will unite to stop buying that nation’s products. Sure – a big ask – but never before has there been such international unified communication. Perhaps we are on the cusp of a revolution, but a new type of revolution – not arms of weapons, but arms of people raised in protest – the revolution of the passive refusal to be a consuming conspirator of pessimistic politics! I say: “LET THE REVOLUTION BEGIN!” – switch off Murdoch!